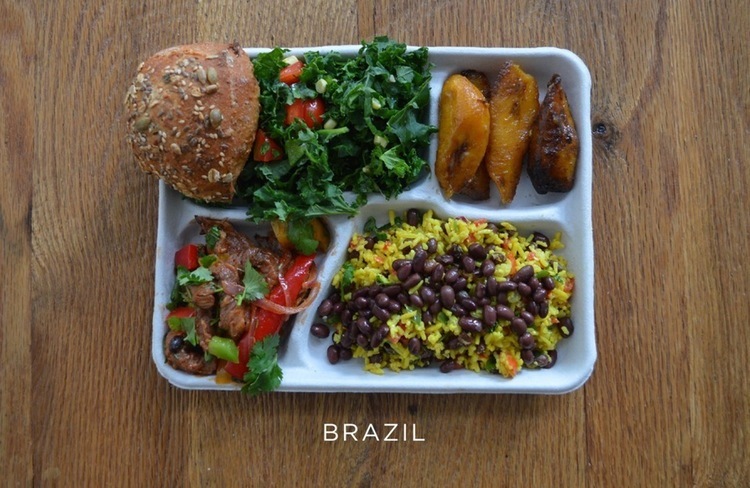 What Do School Lunch Programs Look Like From Around the World? 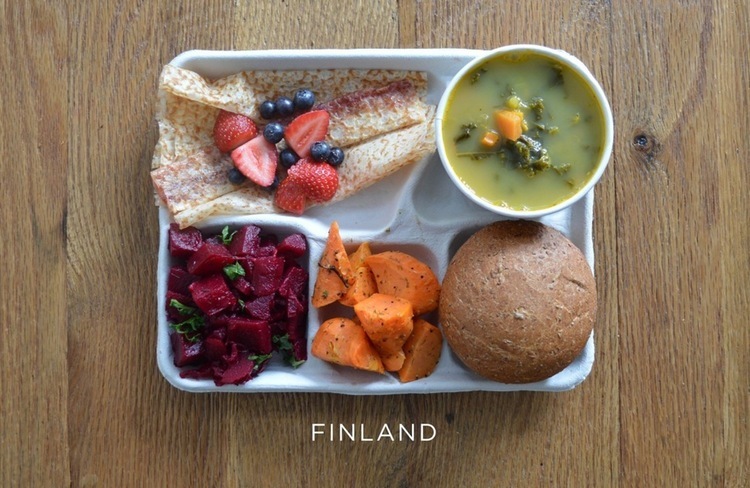 November 12, 2015 By Mobile App, News, SchoolsComments Off on What Do School Lunch Programs Look Like From Around the World? Here at The Lunch MOB, we like to discuss and help educate you on why healthy school lunch programs are so important for your kids. 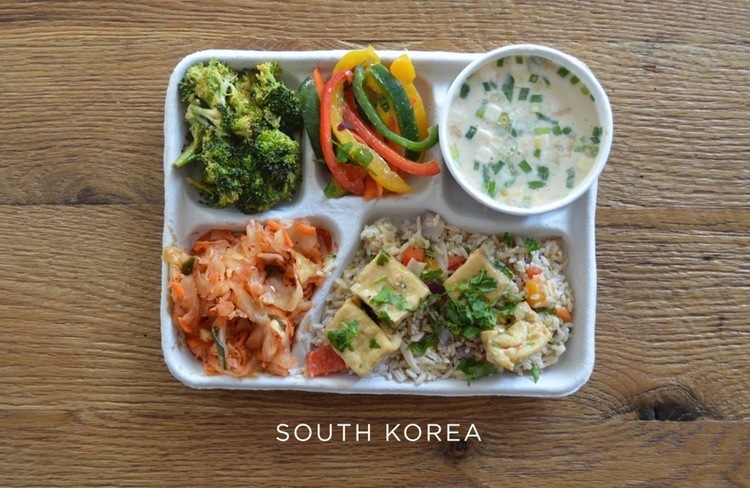 Recently there were some photos taken of school lunch programs from around the world that were a striking contrast from what American children are eating every day at school in the U.S. Even with the recent shift from government to get a better handle on school lunches being served to millions of children in the U.S., there are still roughly 32 million children eating unhealthy cafeteria style lunches every day. That number does not account for large number of kids attending private schools or the children who bring lunches from home. Our nation is becoming more and more aware of the childhood obesity rate in our country that has truly become an epidemic. The Lunch MOB is a company that is looking at a fresh and unique way to not only battle this very problem in the schools with their unhealthy school lunch programs, but also to provide parents with an easier and healthier solution to the boring, brown bagged lunch alternatives. One of the biggest challenges The Lunch MOB has solved is finding fresh ingredients and nutritious foods that kids will actually eat. We have all seen the news in the last year of kids around the nation taking to Twitter and other social media channels to refuse and boycott the first lady’s push for healthy meals. As the saying goes, “you can lead a horse to water, but you can’t make them drink.” The Lunch MOB has created more than 60 different meal choices for kids and parents to choose from, allowing even the pickiest of eaters to find something they will like. Local caught fish served on top of a bed of arugula. freshly made pasta with a lite tomato sauce, crisp red seedless grapes, a child’s version of caprese salad, and a freshly baked baguette. 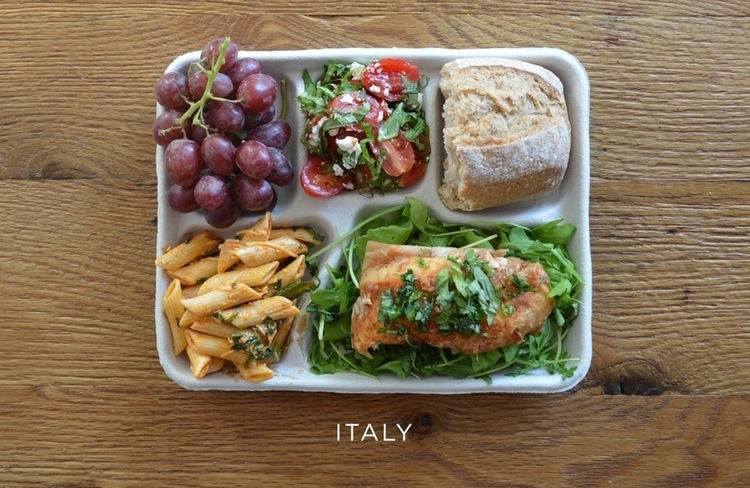 Lot’s of great choices here for kids, and of course since this is Italy, you would expect to have at least one pasta dish. Freshly cooked pea soup, whole wheat roll, carrot salad, beet salad, and pannakkau (a thin dessert pancake) topped with some fresh berries. You will notice in this meal there are no meats being served, depending on how the pea soup is cooked of course. 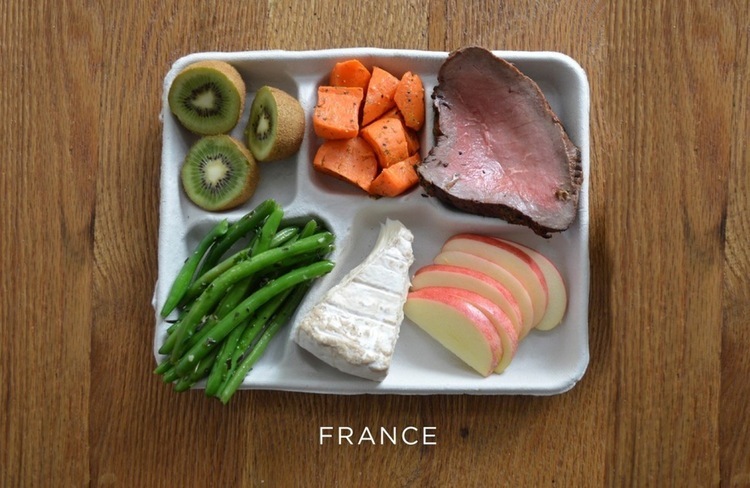 Apple slices, Locally made cheese, fresh green beans with seasoning, kiwi slices, and seasoned cooked carrots. You will notice with this meal that is straight forward ingredients with some seasoning. Of course you can have a meal in france without some cheese. Black beans and rice, pork with some local veggies, whole grain roll, fresh green salad, and some baked plantains (similar to bananas). This meal is rich in local and nationally grown ingredients. This meal represents its home country very well, bright and full of life. Seasoned and cooked tofu over white rice, kimichi (traditionally a fermented side dish made of vegetables and a variety of seasoning), broccoli, red-yellow-green cooked peppers, and a fish soup. Notice that most of this meal is made up vegetables and grain. 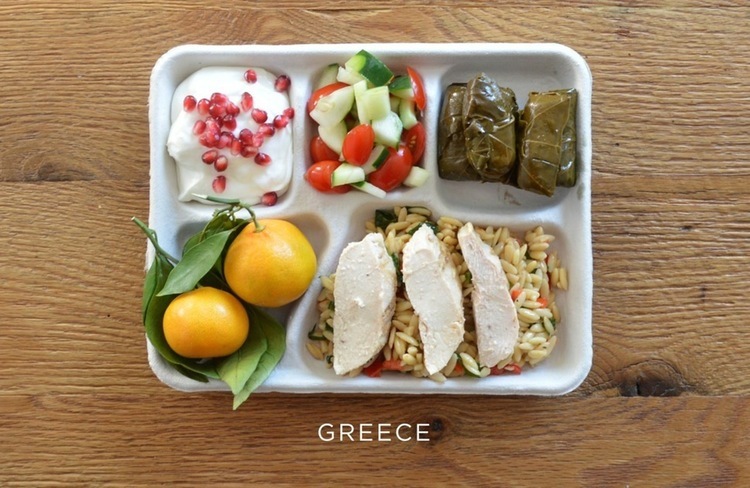 Baked boneless skinless chicken breast laid atop cooked orzo (pasta that resembles rice), fresh small oranges, greek yogurt with some pomegranate seeds, cherry tomato and cucumber salad, and steamed stuffed grape leaves. This entire meal speaks to greece, especially the use of citrus and “greek” yogurt. 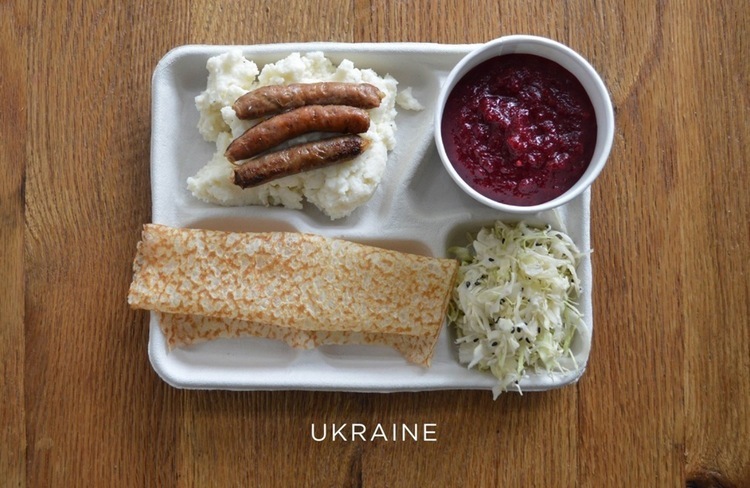 Cabbage salad, syrniki (a local dessert pancake), mashed potatoes with locally made sausage links, and borscht (a ukrainian soup that is usually made of beets). No doubt that this is a very simple meal, but made with locally grown and made foods. 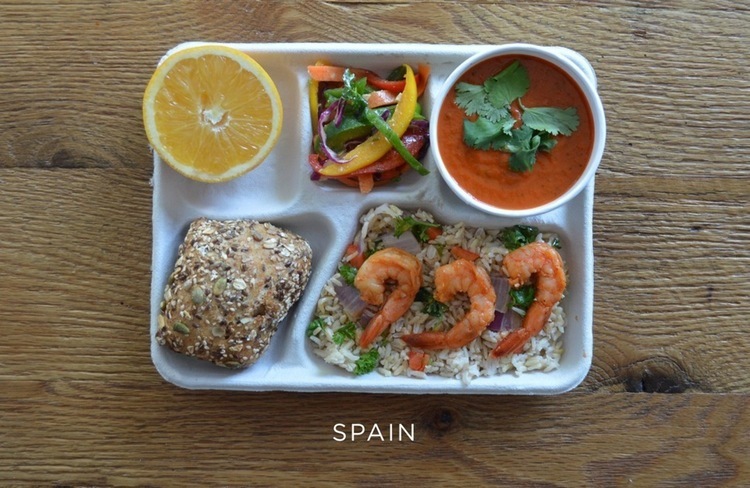 Sauteed peeled shrimp on top of a bed of brown rice and vegetables, whole grain roll, fresh orange, fresh pepper salad, and gazpacho (this is a juice, often misidentified as a soup, made from fresh raw vegetables and served cold). Another meal made from raw and fresh ingredients. 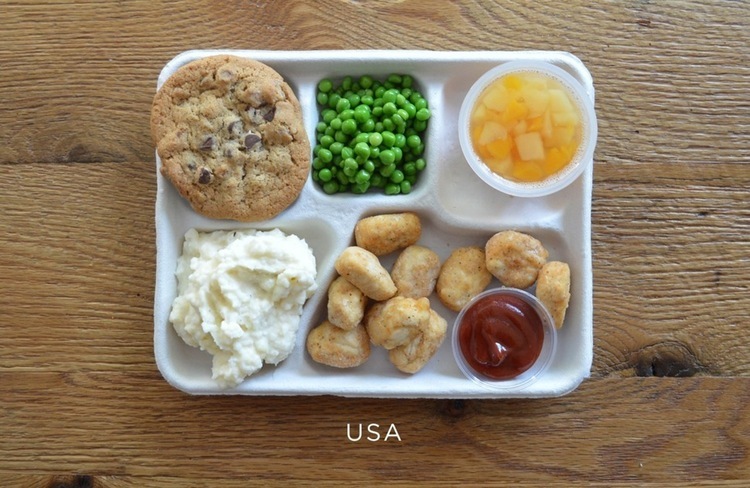 Fried processed “popcorn” chicken with processed and sugary sauce, mashed potatoes, chocolate chip cookie, canned green peas, and canned fruit cup in syrup. 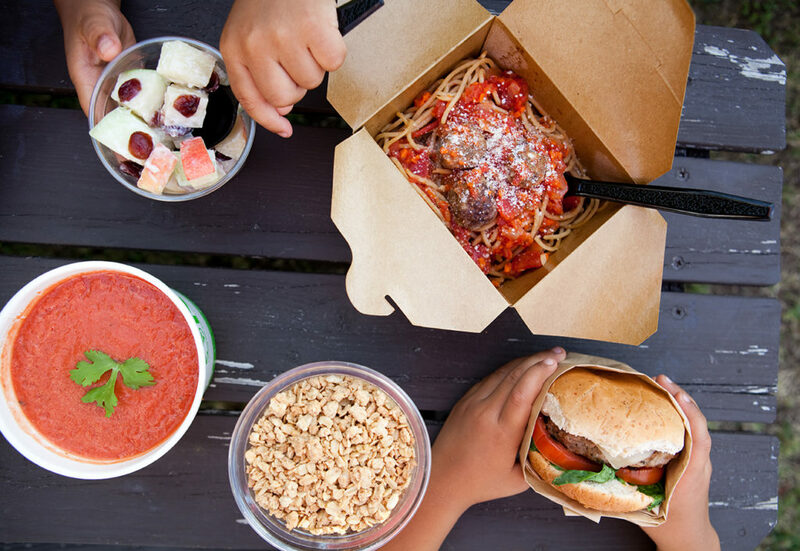 The Lunch MOB carries more than 60 different meal choices, providing parents and kids a choice when it comes to picky eaters, while providing nutrients they need. For example, meals like, “Crunchy Oven Baked Fish Sticks,” provide a healthy alternative to regular fish sticks, this is made with firm and flaky cod fish in a seasoned mixture of low fat parmesan and whole grain breadcrumbs. Take a look at all of the options they have to offer. With Halloween lurking around the deserted street corner next to the shadowy castle on the hill, there are many fun, simple ways to channel the better spirits of All Hallow’s Eve while staying away from the ones that will rot your teeth. With the popular trend of schools taking charge in encouraging good eating with healthy school lunch programs provided by The Lunch MOB, parents can maintain this sentiment through the inevitable candy hauntings and sugar scaring. Jack O’Lanterns can get messy, time-consuming, and a bit frustrating to deal with. However, there’s a way to keep the amusement of those smiling pumpkins while simplifying matters by making them smaller. 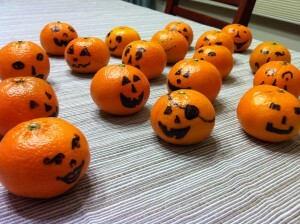 With a marker, you can make small jack o’lantern tangerines or oranges by drawing faces on the peel as a small surprise for your child and a bit of additional incentive for them to eat it. In addition to vitamin C, healthy school lunch programs make sure to give a well-rounded nutritional basis for kids to follow. Naturally, this would include potassium, and this aspect of your child’s diet can be filled with “boo”nana pops, created by Skinny Taste. 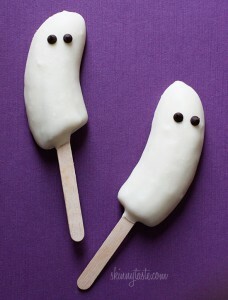 Terrifying puns aside, you can fix this snack hassle-free by dipping bananas into liquid white chocolate, decorating to make them look like adorable ghosts, and freezing them overnight to be packed for tomorrow. They each only have half-an-ounce of chocolate per pop, making them much healthier than a standard chocolate bar from that shady haunted house next to the dim lamplight down the crooked street. Pizza doesn’t really grant a sense of healthy eating to many, but with new, innovative recipes and clever placement of vegetables, pizza can get as healthy as brussel sprouts doused in fish oil while actually being edible, and wonderfully so. 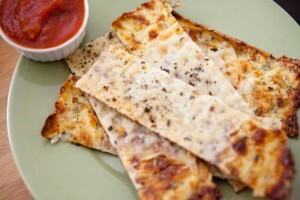 With The Lunch MOB’s healthy school lunch programs, you can find a cauliflower bread substitute. Turn this into a splendid Frankenstein pizza creation with tomato sauce and some toppings of choice, and it becomes a lunch your children will assume to be you spoiling them because it tastes so nice. 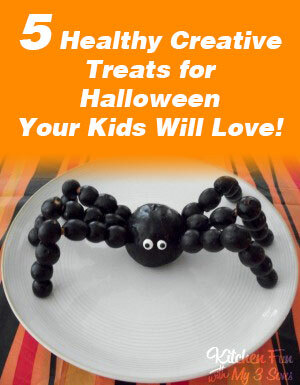 Keeping in touch with Halloween, you can theme the meal by slicing them into finger-shaped portions and tagging the top with a fingernail-shaped tomato slice, turning your kids into zombies that obtain 80% of their daily vitamin C with every serving. 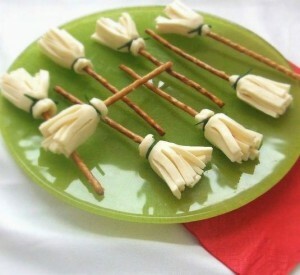 Grains are an important part of healthy school lunch programs, and you can inspire a bit of Halloween spirit by turning pretzel sticks into witch brooms, created by Cocinanda Con Catman. Take a piece of cheese, cut it into a square, wrap it around the end of a pretzel stick, and keep it in place with chives as string. 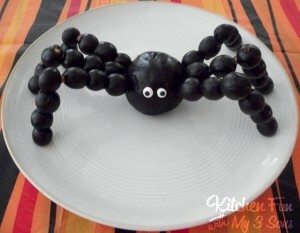 They look great as a party snack too, as you can lay them on a flat plate at a costume party. Of course, it proves difficult to be creative with snacks and lunches with busy schedules and lots to do at home.The Lunch MOB can help you keep your children healthy with artisan, tasty meals delivered every school day — put together from scratch using ingredients from local growers — and it’s sure to free up a bit of time for your clever ideas, regardless of the season.